MIRROR PLANT, a plant simulator based on physical modeling, precisely simulates dynamic plant behaviors. It can also forecast future plant behaviors by running the virtual plant faster. Based on the information from MIRROR PLANT, operators can understand possible conditions which may cause alarms, and run the actual plant much more safely by eliminating such potential alerts. Although this function is very useful, there is a possibility that operators may mistake forecasted information for data from actual plants, or vice versa, because both are displayed on the same screen of the distributed control system (DCS). To prevent such confusion, the human machine interface (HMI) of MIRROR PLANT clearly distinguishes them by dividing the time line from the present time. 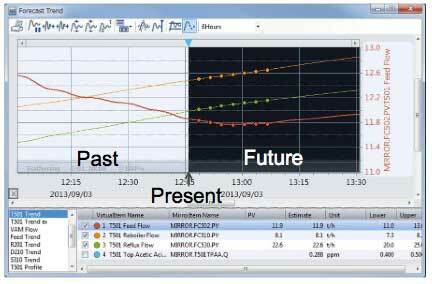 This paper introduces the design of MIRROR PLANT HMI for forecasting plant operations. For safe plant operations, it is critical to correctly understand the conditions encountered by operators inside the plants. In relation to this topic, human cognition has been studied in various fields such as human factors and ergonomics. Mica R. Endsley defines the concept of situation awareness (SA) as follows1 2. When applying these definitions to plant operations, knowing measured values of a DCS falls into definition 1; operators' understandings of plant conditions based on the measured values is categorized in definition 2, and projections of the near future based on the understandings fit definition 3. MIRROR PLANT is an online dynamic simulator that can accurately simulate actual plant behaviors. This technology visualizes values in real time, such as temperature, pressure, flow rate and composition, which are not actually measured. This means the simulator offers redundancy for perception defined in the SA. The forecast feature of the MIRROR PLANT visualizes near future plant conditions, which operators may imagine, allowing for forecasted plant operations independent of operators' experiences and skills. Operators can operate a plant while monitoring the information in the MIRROR PLANT because it can be displayed on the human interface station (HIS) of the CENTUM VP. This doesn't require additional display units in a control room, and eliminates inconvenient monitoring using multiple displays. However, historical and future information are eventually displayed on the same single screen. To avoid confusion, the human machine interface (HMI) of the MIRROR PLANT clearly expresses the difference between their time segments. This paper introduces the HMI for achieving forecasted plant operations by displaying future information. Amid severe global competition and strong demands such as for improving production efficiency in recent years, the level of safety required at production sites is getting higher. In Japan, various efforts such as automation in facilities and improving functions in systems have been made. Enhancing the design of HMI in particular is drawing attention for the ensuring of safe plant operations. An HMI is a critical function for interfacing operators with systems, and its usability greatly impacts on the safety of plants. In particular, its consistent display design and operational procedures are crucial for preventing wrong operations. However, conventional HMIs are optimally designed specific to each plant and facility system, and this causes inconsistency within HMIs, and obstacles to plant integration, operator relocation, and overseas expansion of plants. Although some leading manufacturers prepare their own guidelines, including items to be considered for HMI design to avoid these situations, they are often incomplete or insufficient. Currently, various research institutions and companies are studying methods for designing an HMI focusing on usability. In particular, the International Organization for Standardization (ISO) is developing guidelines relating to human-centered designs known as the ISO 9241, involving people in various academic fields such as ergonomics, cognition, and emotional engineering. Although basic concepts for designing an HMI are defined in the guidelines, the guidelines alone are not sufficient when actually designing an HMI; the study of more detailed expression methods and operability is required. The HMI for plant operation will come to be a more important subject of investigation. In order for operators to understand internal conditions in the plant well, the HMI must be configured so that they can perceive information easily, understand the information easily and project possible situations based on the understanding in accordance with Endsley's definitions 1 to 3 respectively. Not only operators and engineers at sites but also designers with ergonomic knowledge should be involved in designing the HMI. It is also important to repeatedly study how the HMI should handle unexpected situations of processes. It is difficult to presume which information should be displayed to operators in such situations. For most operators who are accustomed to operations and monitoring on automated systems, it is difficult to restore the process to a safe state under such circumstances. Accordingly, training with simulators and introducing systems for shutting down plant operations safely are required. In addition, it is recommended to establish the operations style in which operators monitor processes while projecting future status on a routine basis, and take appropriate actions before any risks materialize. The MIRROR PLANT, which can precisely simulate dynamic plant behaviors, offers various applications. 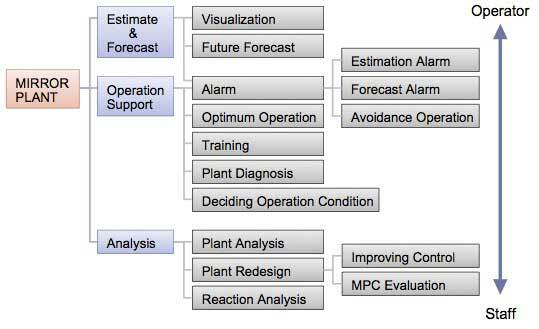 Figure 1 shows various application examples classified for the estimation and forecast functions, operation support functions, and plant analysis functions. The estimation and forecast functions visualize the values of temperature, pressure, and flow rate, etc., for which sensors are not actually installed in the plant, and the values of composition, etc. which are impossible to measure in real time (hereafter referred to as the estimated values). This function also visualizes the future projections of internal conditions in the plant by executing the MIRROR PLANT faster than the actual time passage (hereafter referred to as the visualized projections' forecast values). The operation support functions include the estimation alarm function which can set alarm limits for the estimated values, the forecast alarm function which works with the forecast function and creates alarms against possible abnormality if the current operation conditions continue, and the supporting function to operations for avoiding future danger from occurring with the activated forecast alarms. The operation support functions also include the plant diagnosis application which detects abnormality in the plant before actual sensors do by calculating the steady-state balance of the plant and then comparing the results with actually measured values. The MIRROR PLANT is useful for analysis applications such as the parameter determination of PID controllers for stabilizing processes and the trial calculation of the introduction effect of multivariable model forecast controls. Integrating functions of the MIRROR PLANT can provide useful applications for not only operators but also staff involved in tasks for improving the productivity, stabilizing the quality, and so forth at production sites. The following sections introduce the HMI achieving forecast plant operations using functions for operators such as the estimation and forecast functions and the alarm function in the operation support functions. The information layout and background colors for the screen specific to the MIRROR PLANT were designed on the basis of the above rules. Other elements of the HMI were designed in accordance with the look and feel of the DCS, allowing for operations without any additional knowledge. Figure 2 shows an overall view of the MIRROR PLANT HMI. The vertical bar on the left is the MIRROR PLANT browser bar. 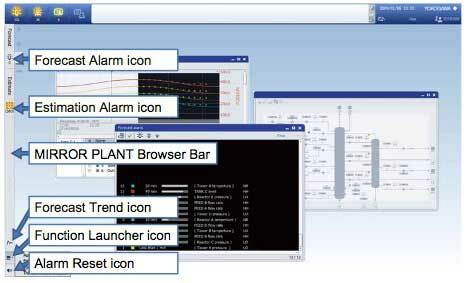 Applications of the MIRROR PLANT, such as the estimation alarm, forecast alarm, and forecast trend, can be started by clicking the icons on this bar. The browser bar is positioned on the left side for ensuring a larger area for monitoring, assuming that wide liquid crystal displays (LCD) will be widely used. The icons for starting the estimation alarm and forecast alarm, which require continuous monitoring, are positioned on the upper left, near the alarm icon of the HIS, to reduce operators' eye movements. The icons for starting the forecast trend and alarm reset, which are expected to be used frequently, are always displayed so that operators can activate these functions with a single click. Less frequently used functions can be started by selecting the function displayed on an application list which is displayed by clicking the function launcher icon. Estimated values, the calculated results of the MIRROR PLANT, can be displayed as instantaneous value data, stream flow data, and in-tower visualized data on the graphic screen of the HIS. Figure 3 shows an example of instantaneous value data display. To distinguish information resources, estimated values of the MIRROR PLANT are displayed in parentheses. To clearly distinguish "1" from a parenthesis "(", a space is added between data characters and the parenthesis. Although Yokogawa recommends parentheses, other symbols or no symbol can be selected by engineering depending on the plant specific HMI design policy. 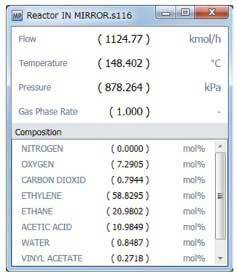 Figure 4 shows a window for displaying stream flow data. By clicking the corresponding icon on the piping graphics screen of the HIS, this window is displayed, and operators can monitor a temperature, flow rate, pressure, and composition in real time. 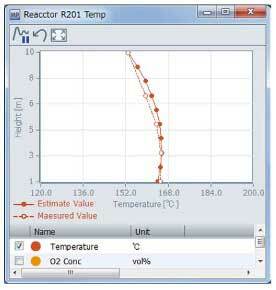 Figure 5 shows a window for displaying in-tower visualized data displayed by clicking on the corresponding icon near the reactor or distillation tower in the graphics screen of the HIS. The Y-axis indicates the height in the tower, position number of a tray, etc., and the X-axis represents a temperature, composition, etc. Even when a sufficient number of sensors are not installed in the vertical direction for providing the distribution, operators can monitor temperature or composition distributions in the tower seeing the chart of the estimated values. Figure 6 shows a forecast trend window. This window is displayed by clicking on the forecast trend icon on the MIRROR PLANT browser bar or selecting "Trend" on the pop-up menu displayed by right-clicking on the window for instantaneous value data display. The current time is shown at the center of this window, the left area is for the past trend and the right area for the future trend. The background color of the past trend area is the same as that of the existing trend display, and the background color of the future trend area is its complementary one, which clearly shows the difference between the past and future trend. In the past trend area, actually measured values of the DCS and estimated values of the MIRROR PLANT are plotted in chronological order. In the future trend area, the values currently being forecasted are plotted by small solid circles and the trend of the last forecasted values is shown in a solid line. Thus, after the present forecast cycle completes, the series of small circles turns into a solid line, and the next forecast cycle start and new small circles are added. Because the forecast for the next one hour takes about one to two minutes though (depending on the modeling range of the plant by the MIRROR PLANT and hardware specifications), the last trend as well as ones in the forecast can be displayed at the same time. Ranges defined by the thresholds can be displayed on the forecast trend window, which allows operators to monitor whether the trend in the future goes out of the range or goes back into it. Figure 7 is a forecast alarm window displayed by clicking the forecast alarm icon on the MIRROR PLANT browser bar. Thse background color of this window is the same as that of the future trend area in the forecast trend window to easily identify that it indicates forecast data. Similarly, the estimation alarm window, though its figure is not shown, is displayed by clicking the estimation alarm icon on the MIRROR PLANT browser bar. The information shown in the estimation alarm window is the past data, so its background color is the same as that of the past trend area in the forecast trend window. These colors are useful for identifying the time attribute, past or future, of each alarm. The forecast alarm window shows how much later an alarm occurs in numerical values, and also shows it in an analog form as the progress bar, which allows operators to intuitively understand the urgency. The importance of each tag is shown as the color of the icon. For example, a red mark shows higher importance and a shorter progress bar means operators must handle it earlier. By handling possible alarms before actual alarms occur, operators can perform safer plant operations. Figure 8 shows a forecast alarm log window. 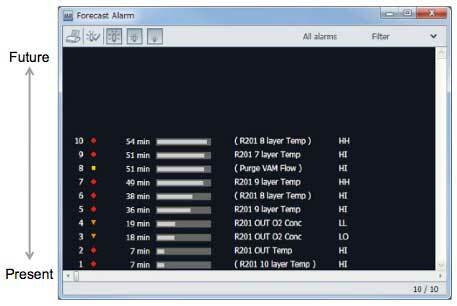 The forecast alarm window shown in Figure 7 is refreshed each time each forecast cycle is completed. 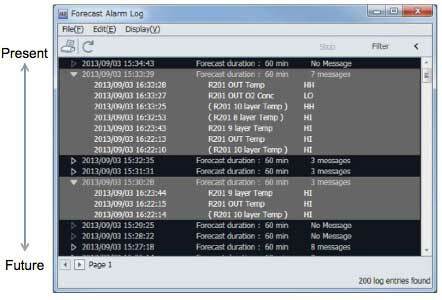 Past forecast alarm messages can be confirmed in the forecast alarm log window, which is displayed by clicking the function launcher icon on the MIRROR PLANT browser bar and then selecting the forecast alarm log in the list. Forecast alarm messages for the forecast alarm log window are saved each time the forecast cycle starts. The forecast is the differentiation technology of the MIRROR PLANT. Yokogawa has developed the HMI which uses the same display as that of the HIS of CENTUM VP and allows plant operations using the information from the MIRROR PLANT. The HMI capable of distinguishing between real and virtual, and past and future was designed on the basis of ergonomics. This HMI achieves the forecast plant operation by making use of the forecast trend, forecast alarm and other applications of the MIRROR PLANT. CENTUM VP is a registered trademark of Yokogawa Electric Corporation.